Workshops are geared towards all levels of students. Our instructors gauge the workshop content based on the students in class. All levels will benefit from these great workshops! All workshops will be held at Sa'diyya's studio in Frisco, TX. Get your Control-Freak on in this seriously challenging technique drills workshop! Sa'diyya will share advanced drills to make your brain hurt and your body work. Drills included will be layering, extreme isolations, level changes, traveling steps and more! Great technique is what enables you to clearly communicate your artistry and emotion, especially during improvisational performances when you don't have choreography to fall back on. ​You will come away from this class with a clear sense of how to achieve complete control in your belly dance movement vocabulary. ​See what students are saying about Sa'diyya's workshops! Get All 5 Workshops For Only $175! Come learn what you need to know to prepare for a successful photo shoot! Miracle and Sa'diyya will lead you through a complete checklist of things you need to do to get that "Picture Perfect" photo. You will learn many tips geared specifically for photos to improve your hair and makeup, how achieve the most flattering costuming, how to get the perfect live shot, how to pose in front of the camera for still shots and more! ​Get All 5 Workshops For Only $175! ​Reserve your spot to participate in the Live Photo Shoot Pre-Show Event for the "Cairo Cabaret" Gala Show with Miracle Bennett on Saturday June 10, 2017 from 7:00 pm - 8:00 pm! Within every Orientale composition, there will be bits and pieces of regional rhythms and Folklore--from Oriental Entrance Pieces, to Pop and Shaabi. In this class, Vanessa will guide you through the various types of folklore you may find, and she will review the vocabulary and create combos to go with each of these specific styles. This special workshop will help you to identify the musical cues and changes, and give you the tools you need to know what to do when! Take your dancing to the next level by "Finding Folklore Everywhere!" American Cabaret all the way? 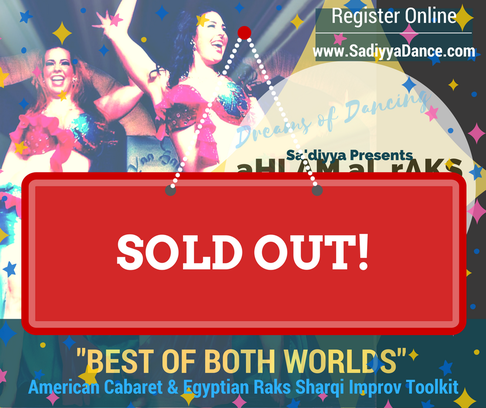 ...Or is Egyptian Style Raqs Sharqi how you rock? ​Either way---we're gonna unlock the best part of your personal artistry! Both well-versed in classic dance genres, as well as Am-Cab & Egyptian styles, Sa'diyya and Vanessa will take your dancing to the next level--breaking down the similarities and differences between the styles, and helping each artist discover a piece of themselves in all of it: Steps, Combinations, Concepts, Musicality and Musical Interpretation----the key to improvisation. Unlock the freedom to freestyle to ANY style, and get the "Best of Both Worlds!" Use what you learn in this workshop as a way to get an upper hand in the "Valley of The Queens Live Music Improv Competition!"